A website has been launched which allows users to search a document signed by thousands of Home Rule opponents in 1912. 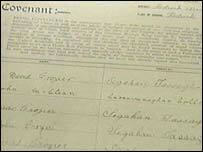 The Public Records Office in Belfast has put every signature of the Ulster Covenant into a searchable database. Newspapers at the time reported a frenzy as people queued on 28 September 1912 to sign what was described as "a solemn and binding oath of resistance to Home Rule". Gerry Slater of the Public Records Office said it was a key document which would not only be of interest to unionists. "I think we can all look at these documents without feeling threatened," he said. "When you go online, you get the story - you get why people did it - and I think it's important we understand that." Many were reported to have signed the Covenant using their own blood. However, Dr Eamon Phoenix of Stranmilis College said some of the myths surrounding the Covenant had been dispelled through the high-tech transition. "It wasn't burned, and we can only find one signature in the archive that was actually signed in blood - that of the eccentric gun-runner, Major Fred Crawford. "There's one signature in Irish, and there's one signature which was discounted because the signee was a Roman Catholic," he said. The database is a useful tool for tracing family trees. For example, a search for Democratic Unionist leader Ian Paisley's ancestors reveals 90 people with the surname signed the Covenant. More specific information reveals that his father, James K Paisley, signed the document in Omagh, County Tyrone. If you click again, you can see his actual signature.